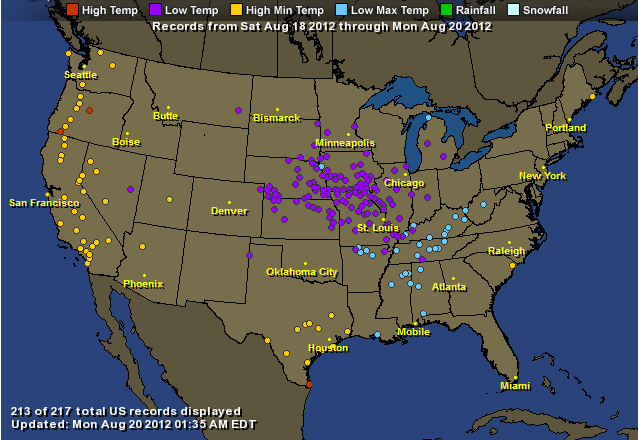 US record lows outpace record highs 127 to 4 this weekend | Watts Up With That? Since we were treated to scads of news articles by the MSM on how many record highs happened in July, it seems only fair that we report on the multitude of record lows that occurred this weekend in the USA, and I doubt we’ll see the sort of coverage the highs got. A number of these record lows go back into the past 100 years or more. OH MY GAWD!! We’re all gonna freeze to death. What are the chances that with a random climate roulette wheel that this would happenz??? It now appears that there is an anti-random foot pedal weighted loading of the climate roulette wheel. Actually on a more serious note I find it amazing you can set record lows with all the temperature adjustments that go on. But maybe they don’t need to adjust Tmin as it appears to be going up on its own (yes, I know this is a prediction of the climate models). Also, note the randomness of the four years where highs were broken. The previous records were in 1982, 1941, 1913, and 1966. Not all in the last decade. Am I reading the map incorrectly? It would appear that there were “high minimum temps” in Bismarck, Denver, Raleigh, NY, Portland, Chicago … why would there be HMTs in just those major cities? What about all the non-big-city areas around them? The generalized “low temps” seem to all be sitting out in the middle of nowhere. One day we are all freezing to death due to global warming?! While we haven’t broken any records where I live, it is definitely cooler than normal in SW Ohio. I don’t recall the last August (especially mid-month) when I’ve had the windows open, and wearing an extra shirt… and to top it off, the Starlings are already beginning to gather together. Normally, they start flocking in latter half of September. That’s not a good sign if you’re hoping for a mild winter. Now if we could just get 2-4 inches of rain over a 5-6 day period. I would hate to live in the Midwest at the moment. Between drought, heat waves, record low temperatures your weather is bouncing around all over the place. Ahh! OK… “Never Mind!” as that SNL gal used to say. The yellow dots for those cities are tiny ones, not quite the same as the slightly larger yellow circles. No idea though why the mapmaker would pick out a seemingly random dozen moderately large cities to name on the map. Prineville, OR has grown quite a bit in the last 20yrs and is currently sticking a google server farm in. Someone might want to take a peek at how siting looks. The record cold weather was predicted by the models and is consistent with global warming “weirding” the weather. As CO2 continues to assert its control over the weather [insert gobbledygook], therefore we must re-double our efforts to send energy costs to unprecedented levels. The whole reporting of record highs is a sham. You don’t say what set of weather stations these are. Here in Kansas City, the KCI airport station is the “official” NWS station, and they set a new low record too, on the 17th. Old record was 1943. And no, no one made a big deal about it. And I’ll bet you won’t hear one word of it in the MSM. Except for “this is consistent with climate change models. The earth is getting warmer”. I spent a very pleasant Sunday afternoon yesterday with an elderly (many years of local experience) farming couple. Millie announced that fall has arrived here and that winter will be early. The Dog Days – Dies Caniculares – occurred when Sirius, the Dog Star is high, in July & August, and as hot as tradition demands but are still called exceptional. How much of CC/GW hysteria is Gen-whateverrr learning how nature and the world really are after their coddled adolescence? Millie’s husband, Duane is definitely hard-boiled. Anthony, I’m a bit sceptical of the 26 reported by your source for Big Rapids, MI. It certainly has been colder than normal in central Michigan and not widely commented on but that’s 10-20+ deg lower than the lows reported for other stations in the region on the 18th and well below freezing. It just kind of jumped out at me. Even if this one is incorrect it doesn’t change the point of your post: Temps are well below normal over a large part of the country and no one is crying “Climate Change”. Right now it is 68F with a light rain in Raleigh, directly south in Chapel hill (small airport) it is 67F, south of that in Moncure (very rural) it is 67F at 737 AM. With a lot of black top at airports a higher minimum especially where it is humid would be expected. Notice you are seeing the high minimums along the seacoasts. Houston TX is well known for being a steam bath. With the purging of the temperature stations, The ‘Station drop out’ problem from 1990 onward until the number was reduced from 7250 to about 1900 in 1992 and further to about 960 stations in 2006 a lot of the rural stations got dropped. According to Smith, there’s also been an affinity for retaining airport stations over other kinds of stations. His count shows 92% of GHCN stations in the USA are sited at airports, with about 41% worldwide. Do not tell me these turkeys couldn’t find nice rural stations like the one at Moncure used to be (Old Chestnut Crossing). Heck nearby Sandford and Pittsboro (12 miles west and south) have recently been moved to the newly built “Raleigh Executive Airport” too. WeatherUnderground now automatically pops up airports and you have to fight to get the non-airport stations. Lies.All lies!!! Haven’t seen or heard anything about this from the LSM (Shirley I don’t need a sarc tag). Anywho,I noticed a lot of those “record” min temps were actually just ties. So shouldn’t the line say ” met or beat” record lows? I can’t speak for the other cities, but here in North Carolina it was a cloudy, rainy day all day. Clouds hold temperature down during the day but up at night too. When you average the temperature, it was well-below the 30 year “normal”. The Raleigh measurements are at the local airport too. I live 50 miles east of Raleigh. When I drive into Raleigh, my car’s temperature reading always increases by 3 degrees or so going into the city and drops by the same amount leaving. The urban heat island effect can be easily felt driving in and out of Raleigh. First major Canuckian cool-air mass of the season. Right on schedule. Arctic is cooling down too. Y’all in the US midwest understandably may welcome this, but I lament the decline of summer…. Noteworthy. Weather is fickle. My only real concern is the similarities to the 1930s. Given CO2 had nothing to do with that, I think it unwise to assume it does today. Given the suffering of the 30s, I think it wise to prepare. Build more reservoirs, and pray they fill. When the humidity is low the temperatures bounce a lot. Think deserts. Sleepalot did a comparison of the Brazilian rainforest and the N. African Desert. … The effect of the addition of water vapor (~ 4%) is not to raise the temperature but to even the temperature out. The monthly high is 10C lower and the monthly low is ~ 10C higher when the GHG H2O is added to the atmosphere in this example. The average temperature is about 4C lower in Brazil despite the fact that Algeria is further north above the tropic of Cancer. Some of the difference is from the effect of clouds/albedo but the dramatic effect on the temperature extremes is also from the humidity. I took a rough look at the data from Brazil. Twelve days were sunny. I had to toss the data for two days because it was bogus. The average humidity was 80% for those ten days. The high was 32 with a range of 1.7C and the low was 22.7C with a range of 2.8C. Given the small range in values over the month the data is probably a pretty good estimate for the effects of humidity only. You still get the day-night variation of ~ 10C with a high humidity vs a day-night variation of 35C without and the average temp is STILL going to be lower when the humidity is high. This of course backs up the comment of another who keeps saying temperature alone is the WRONG parameter and we should be including humidity in the calculations too. Of course the Specific Humidity has been falling since 1948 according to NOAA so the Climastrologists would not want to call attention to that fact. The increase of CO2 is supposed to cause an increase in water vapor so the effect of CO2 can be multiplied by a factor of three to get the 2 to 4 C increase in temperature so widely publicized. Therefore a decrease in water vapor (negative feedback) would suggest that there has been a corresponding decrease in CO2 or at least the effect of the CO2 has been greatly diminished and not multiplied. Kind of takes the “Catastrophic” out of the news doesn’t it. Who fiddled with the “climate dice” again? This is what global warming looks like! Global Warming … is there anything it can’t do? When the humidity is low the temperatures bounce a lot. In Ireland we get the opposite effect. Constant humidity moderates the temperatures. With 50″ of rain and a semi-permanent position just North of the Polar Front, we have very mild temperatures. In Winter we get a couple of cold spells a year with an inch or so of snow, but it never lasts more than 2-3 days. In Summer 80F is a rare hot day to be remarked upon (we mostly speculate when it will stop raining!). We are at the latitude of Seattle, with the Gulf Stream flowing past to warm things up a bit. The only sign of climate change here is a long term trend becoming a bit warmer, and even wetter. I suggest making this a weekly feature so we can all see if and how the highs and lows are changing. But why leave out the High Min and Low Max temps? They are significant too, no? While I don’t doubt that the vast majority of these will stand, I can guarantee with 100% certainty that the Pulaski, TN record is wrong. It did not even get into the 50s anywhere near there this past weekend, so there is some kind of mistake. Again, that doesn’t change the overall result. Record highs followed by record lows? Oh no. Climate disruption! CO2 caused this! And of course the swing from record highs to record lows will be blamed on global warming….and the Koch brothers! Isn’t that amazing? We have had warm weather in SE Europe for the first couple of weeks of August, and now it is much cooler. Extreme weather, no doubt, for the last 50 to 100 years…. And all the Greek mountains that are scheduled to have wind farms are on fire by some miracle… But we shall be saving on CO2 with the windmills. I am very interested in temperature measurements and would very much like to quote this information because it is so important. Where can I find information on “Smith” and these results? Snowfalls? Appalachians? In the southern Canadian Rockies we’ve already had snowfall at moderately low altitudes, but in the eastern US? The High Min Temps on the west coast seem to be along the I5 corridor. September cool front in August in North TX. Does this mean we are 20-25 days into fall now? Starlings were flocked up this morning. Let’s see what the grackles do the new few days. The knocking down of the thermal Southern Plains ridge this early will have real consequences weather-wise the next few weeks. This is uncharted territory. Just goes to show how the exceptional warmth in the Arctic which is melting out the polar ice has disrupted the jetstreams so that the cold air is pulled down ove the midwest. Expect much more of these extremes in both directions as the polar amplification of AGW causes weather patterns not seem for at least a thousand years ! What you are decribing is weather, nothing more. And the long term temperature trend [the green line] is decelerating, not increasing. Sorry to have to bring actual science into the discussion, but what you believe just ain’t so. I’m thinking the 26 in MI might be a misprint for 36, which would still be a new record. Likewise possibly for Pulaski TN and the one in TX; they dropped so far below the previous record that a misprint is highly possible, without in the least changing the fact of so many new or tied low records. Here in central VA we are at 71 having just finished with a light drizzle; very cool for nearly noon in August. Yesterday the airport zoomed all the way to 75, but we didn’t exceed 72 here. Still humid, though; hard to work outside for long; my glasses steam up and so do I. Interesting that the ‘blanketed’ readings (high lows and low highs) on that map are all in the mountains. Usually that’s where you find the low lows. izen’s belief system convinces him that he actually knows the weather patterns from a thousand years ago… and he knows that AGW is the cause of everything currently observed. But in reality, there are no ‘extremes’ currently. This has all happened before, repeatedly, and to a much greater extent. We are now in a “Goldilocks climate”, where temperatures have been unusually flat for the past century and a half. There is zero scientific evidence to support izen’s baseless belief – and plenty of evidence that refutes it, such as the verifiable fact that rises in CO2 always follow rises in temperature. The alarmist crowd never did have any scientific evidence on their side, only their misguided belief system. Religious belief in CAGW seems to be enough for most of them. Crazy, no? Having enjoyed one of the most wonderful, warm summer in ages in Waterloo, this should be the time of year when it is unbearably hot. The CNE is on! (Canadian National Exhibition). I have seen the Shell Tower temperature hit 106 F and that is right at the lakeshore. That was in 1969. Today, fall is here. Leaves on maple trees turned over the weekend between Waterloo and Stratford. It is getting too cold to wear shorts – my knees are freezing! The statement that ‘climate models forecast’ the current cold weather can’t pass without comment. What a load of BS. Show me a climate model that actually predicts much colder weather around the world. 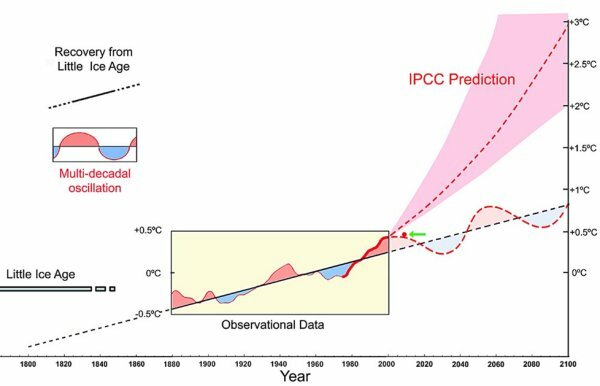 That ‘prediction’ is just CYA bull-speak from warmists who see their gold-plated predictions being trashed by Grandma Nature who has apparently taken a dim view of their alarmist nonsense. Next we will be hearing from the CAGW camp that we need to reduce the CO2 level of the atmosphere in order to bring temperatures up again. If it continues to get colder, at least we will be able to burn all the Stupid lying around to thaw the pipes. It has been a slightly wetter year here in Florida. Clearly the only explanation is that global waring is causing droughts and rain at the same time. What do the stats of record highs and lows tell us? Both AGW proponents and AGW skeptics believe that global temperatures – with a lot of averaging – change with time. AGW-ers believe that we now have unidirectional warming, for ever and ever amen. Skeptics also believe that climate changes, but that at short-medium time scales this change is a roughly sinusoidal oscillation. And we appear to be currently at the top of an oscillation with maximal temperatures for a century or so. So there is no problem from the skeptic point of view for there to be currently more record highs than record lows. We are at a peak of natural temperature oscillation so more record highs would be expected than record lows. In a trough the opposite is expected. So what is the big deal about record highs and lows? I Carnac the all seeing seer, see the August 2012 headline from the great whore J. Hansen. August 2012 was the the hottest month ever. The desert Southwest and West Coast were the drivers of the heat. Never mind the cooler temperatures east of the Rockies, as they were just weather. Even now J. Hansen is feverishly rewriting the past record al la Mikey’s nature trick. We are at a peak of natural temperature oscillation so more record highs would be expected than record lows. Expect much more of these extremes in both directions as the polar amplification of AGW causes weather patterns not seem for at least a thousand years. The extremes have been seen in the last 100 years. See this explained very well, after Sioux Falls and a number of S Dakota cities set record lows on 8 / 17. From the report. -” It happened in 1934 when Sioux Falls set a record high of 107 on August 4 to a record low of 39 degrees on August 24. This also happened in 1896 and 1970. The interesting thing about 1970 is we went from a record high of 99 degrees on August 14 to a record low two days later of 48 degrees, and then back to a record high of 99 degrees on August 29.
the Starlings are already beginning to gather together. Normally, they start flocking in latter half of September. That’s interesting I said that last week for our UK starlings! It can’t bring down taxes! Quit the blarney Ireland couldn’t get any wetter! So the trend of record highs outpacing lows has been intensifying and going on for several years – that’s why it got a lot of attention. A one-time blip of record lows may get a little attention, but nobody is saying there won’t ever be any record lows ever again. You should put this information about record lows into the larger context of trends of record highs versus record lows – then it would be useful information. As for media coverage, I can assure you that, if we see a real and documented long-term trend toward lower temperatures, record lows, or if someone shows that global warming is NOT happening, it will get all sorts of media attention. Til then, stay cool! my ‘belief’ system convinces me that the physics that explains the climate of the past is the same as the physics that operates to generate the climate of the present. I do not know what the weather patterns were like a thousand years ago. But I expect them to be similar if the physical conditions, such as Arctic temperatures and ice cover are similar. Yes, I agree. The past climate shows a high degree of variability. Quite small changes in the energy balance seem to cause quite large changes in the climate. Solar input, volcanoes and CO2 levels can alter the climate quite dramatically, as if it was quite sensitive…. I agree with you again, with the proviso that it was true for the century and a half before ~1950. The LIA was noteworthy for the stability of its climate. the variation was small compared to warmer times. The MWP perhaps (of uncertain extent and synchronisation) but more obviously the post-melt Holocene optimum ~8000 years ago were similar on global temperatures to now and show the much greater variation that is expected. As Hansen recently demonstrated from observations, as the average temperature rises the width of the variance increases. Kurtosis is the inevitable process that brings more extremes as surface temperatures rise. Not sure about CAGW which seems to be a rejectionist meme, but AGW is a crazy religion in that it is the only one that has changed its doctrine in the light of empirical evidence. In the 50s when Revelle discovered that the oceans would not absorb all anthropogenic CO2 emissions and they would accumulate in the atmosphere, in the 60s when Plass et al calculated the radiative transfer of energy in the atmosphere and showed that there was a significant energy imbalance caused by rising CO2. The converts really flocked in when simple models made in the 80s were validated by further direct measurement of upwelling and downwelling LWR. Such was the power of theory validated by observation that ‘believers’ now include every scientific institution of any credible reputation ascribing to the ‘belief’, more commonly called an understanding of the physics. I can’t think of another ‘religion’ that has gathered so many followers with scientific theory supported by empirical measurement – can you? Interesting how many record high minimums are in major cities. WUWT? I am no fan of how the media reports on climate issues, but the data from that site do seem to show that record highs for the year to date have far outnumbered record lows. You provide a distorted version of the history of climate alarmism in your post at August 20, 2012 at 12:35 pm. … changed its doctrine in the light of empirical evidence. In the 50s when Revelle discovered that the oceans would not absorb all anthropogenic CO2 emissions and they would accumulate in the atmosphere, in the 60s when Plass et al calculated the radiative transfer of energy in the atmosphere and showed that there was a significant energy imbalance caused by rising CO2. The converts really flocked in when simple models made in the 80s were validated by further direct measurement of upwelling and downwelling LWR. I ignore your ridiculous claim that the climate models (which one? they each emulate a different climate system) have been validated. I deal only with the history. Nothing was overturned by Revelle in the 50s. But his function was a useful addition to knowledge. Nothing was overturned by Plass et al. in the 60s, and their calculations did NOT show “a significant energy imbalance caused by rising CO2” although they postulated that possibility. Global temperature fell from ~1940 to ~1970. There was a general fear that another ice age may be imminent. And alarmists used this to generate a climate scare which raged in the 1970s. Alarmists said emissions of SO2 from industrial activity – notably power stations – were causing global cooling and action to inhibit the emissions was needed to stop dangerous climate change. The fall in global temperature reversed at ~1970 and the rise in global temperature made the global cooling scare untenable by ~1980, so alarmists then morphed the global cooling scare into a global warming scare. Alarmists said emissions of CO2 from industrial activity – notably power stations – were causing global warming and action to inhibit the emissions was needed to stop dangerous climate change. The SO2 scare became concentrated as an ‘acid rain’ scare which continued to rage throughout the 1980s. Climate models had been being developed from weather models. They were still in their infancy by the 1980s (they still are) but the outputs of these models were misused as propaganda to support the morphed scare of global warming which Thatcher promoted to get supporters of the scare to “flock in” (see the link). if someone shows that global warming is NOT happening, it will get all sorts of media attention. It would be REALLY interesting to find out the CRN designations of these 127 stations. Wouldn’t it be ironic if the majority were CRN 3 or CRN 4? Help me understand. With global warming there is to be more water vapor in the atmosphere. Water vapor, being a greenhouse gas, in a warming world ,will accumulate in the atmosphere by increased evaporation retarding the flow of photons from surface to space, increasing the heat energy of the atmosphere, warming the surface atmosphere. Now the hard part. With an increased moist atmosphere; i.e., greater specific humidity, the low temperatures will be less cold, and the high temperatures will be less high. Do I have that right? My expectation then is that with global warming, regardless of cause, there will be higher minimum temperatures and less extreme high temperatures. You have said that the physics of CO2 will inextricably push global atmospheric moisture content higher, which… to my understanding will lead to less extremes, not more. A functioning thermostat will cycle the furnace at the new set temperature: toasty 72 F instead of a chilly 68 F. Are you saying the thermostat is on the fritz? Do we know what that thermostat is? Have I got that right? What have I missed? I have heard that the global atmospheric specific humidity has decreased over the past 60 years. Your physics & position are vexing to me. I have not seen any discussion of this paradox. Is it claimed that there is a complex pattern of micro- (and mini-) climates? If so, it would be helpful to see some carefully analyzed examples. Or does this behavior suggest that there are significant bias errors in the temperature measurement systems? As someone who has been actively engaged in all aspects of temperature measurement for many years, my present disposition is to favor the second explanation. Any comments? 1. Do you care to share the scientific reference from which the picture under the link was taken? 2. I also don’t understand the logic in your statement. What is the link between “natural warming since the LIA” and the “new record lows” supposed to be? 2. Why would the occurrence of some record lows be “doubly bad for warmists”? Is the occurrence of record lows in the daily data at some stations supposed to be in contradiction to anything that has been published in the scientific literature by “warmists”? Or to what? And why exactly did you specifically choose the RSS data set, but none of the other data sets? Because it fits your narrative best about “no warming” for “15 years and 8 months”? All the trend calculations for the global temperature anomaly, which start at or not many years before 1998 are strongly affected by the very strong El Nino in 1998. Your statements that there hadn’t been any (with probability x% statistically significant) temperature increase at the surface or in the troposphere for a time period, where the global temperature series is still dominated by modes of natural variability like ENSO may be technically correct, insofar a (with probability x% statistically significant) trend can’t be detected in the data series, but such a result does not allow any scientifically valid conclusion about whether global warming is an ongoing physical process or not. The non-detectability of a trend in a time series does not logically allow the conclusion that a longer-term trend is absent, because it can’t be logically excluded that the chosen time period was just too short and the trend was only masked by noise for the chosen period. When I first saw this this morning I thought it had to be from some time other than this weekend. I’m in the San Francisco area. I had to use a quilt both those nights. Most of the record night warmth happened not too far east of here. Odd how different the weather was just a one hour drive from here. As I mouse over the record night warmth I see airports, a fire station, a fish hatchery, Burbank Vally Pump Plant(looks to be a sewage treatment plant). At the link scroll down a little and click on the “High Min” tab. It reads like a laundry list of UHI and poor sitting issues! A couple of those locations had a record night time temp for both dates. Speaking of fitting a narrative, why is GISTemp like this? Observe some of those old dates. Quite a few of them happened in one decade – the 1950’s. Out of the 127 records, it looks like that 35 were from that era, with 1955 getting 20 of them. As a matter of fact, the period from 1951-1980 accounted for more than half of those early records. Why did I single out the period from 1951-1980? That’s Hansen’s choice as the averaging period for GISTEMP, his idea of that time being the “normal” for the globe, and becoming the “zero” for his chart. Using the same map, when you look at the past 2 days (18th and 19th), the ratio expands to 9/196 (hot/cold) – and if you look at the period from 13-21 Aug, the values are 218 hot to 480 cold; a little over a 2:1 ratio of low records over hot records. They’ll just say it’s weather, and not a sure sign of CAGW. Reverse it, though – say we had a 2:1 ratio of hot records over cold records in a one week period, and there would be cries of impending DOOM – and announced as front page stories from coast-to-coast. Same time last year, 2011? 105. Thanks for the references. I am well aware of ChiefIO (E.M. Smith, but wasn’t sure that you were referring to him. Now to read all your references. Not to worry. After James Hansen “adjusts and homogenizes” the numbers it will show 127 new highs and 4 new lowes. Yes, that is right, and confirmed by direct observation. That is true for global medium to long term averages, not for local short term weather. Your vexation is the result of assuming that the increased humidity will have a dominant effect at all spatial and temporal scales of reducing the extremes. But the greater variance with higher temperatures can override that. If you have heard that global atmospheric specific humidity has decreased over the last 60 years you must have been listening to Monckton. As usual he is wrong. direct measurement from satellites confirm the rising moisture content. Longer term records are problematic because consistent measuring methods were not used in past, pre-satellite, data, but even with that caveat they show increasing humidity. Local extremes of weather will still occur, in fact become more probable, with rising temperatures caused by rising humidity. This is because the rise in temperature can disrupt previously stable weather patterns. The obvious explanation for the spate of extreme lows referenced in this thread is the position of the jet stream pulling Arctic air down over the US central/eastern landmass. Had a chance tonight to do a bit of web searching on Prineville, OR. The NWS station is at the airport as can be expected. When I used google maps there’s one runway and almost no buildings around it. Map on weatherbug http://weather.weatherbug.com/OR/Prineville-weather/weather-station.html?zcode=z6286 shows two runways and quite a bit has been built up in the area. UHI at work once again I suspect. And why exactly did you specifically choose the RSS data set, but none of the other data sets?….The non-detectability of a trend in a time series does not logically allow the conclusion that a longer-term trend is absent, because it can’t be logically excluded that the chosen time period was just too short and the trend was only masked by noise for the chosen period. While RSS has the longest time of zero slope, Hadcrut3 and Hadsst2 are right behind and are also over 15 years of no warming. Even GISS has no warming for 11 years and 5 months. And yes, there is noise. But note that RSS is 92.2% of the way to Santer’s 17 years and Hadsst2 is 91.7% of the way there. As for Hadcrut3, I really wish it would get updated past March. I do know the later values, but they are not on WFT however I believe Hadcrut3 would show 15 years and 5 months of no warming if updated. This puts it at 90.7% of the way to Santer’s 17 years. As well, it was predicted that Hadcrut3 would break the 1998 record in half the years from 2010 to 2015. It has not happened yet and there is no way Hadcrut3 nor any other set will break any record this year. Further details on 5 sets follow. 2012 started off rather cold but has warmed up since then. So the present rank is not the most meaningful number. Therefore I will also give what the ranking would be assuming the latest month’s anomaly will continue for the rest of the year. I will also indicate what is required for the rest of the year in each case to set a new record. With the UAH anomaly for July at 0.28, the average for the first seven months of the year is (-0.089 -0.111 + 0.111 + 0.299 + 0.289 + 0.369 + 0.28)/7 = 0.164. If the average stayed this way for the rest of the year, its ranking would be 9th. This compares with the anomaly in 2011 at 0.153 to rank it 9th for that year. On the other hand, if the rest of the year averaged the July value, which is more likely if the El Nino gets stronger, then 2012 would come in at 0.212 and it would rank 5th. 1998 was the warmest at 0.428. The highest ever monthly anomalies were in February and April of 1998 when it reached 0.66. In order for a new record to be set in 2012, the average for the last 5 months of the year would need to be 0.80. Since this is above the highest monthly anomaly ever recorded, it is virtually impossible for 2012 to set a new record. With the GISS anomaly for July at 0.47, the average for the first seven months of the year is (0.34 + 0.40 + 0.47 + 0.55 + 0.66 + 0.56 + 0.47)/7 = 0.493. This is about the same as in 2011 when it was 0.514 and ranked 9th for that year. 2010 was the warmest at 0.63. The highest ever monthly anomalies were in March of 2002 and January of 2007 when it reached 0.88. If the July anomaly continued for the rest of the year, 2012 would end up 10th. In order for a new record to be set in 2012, the average for the last 5 months of the year would need to be 0.82. Since this is close to the highest monthly anomaly ever recorded, it is virtually impossible for 2012 to set a new record. With the Hadcrut3 anomaly for June at 0.477, the average for the first six months of the year is (0.217 + 0.194 + 0.305 + 0.481 + 0.475 + 0.477)/6 = 0.358. This would rank 11th if it stayed this way. This is slightly above the anomaly in 2011 which was at 0.34 to rank it 12th for that year. 1998 was the warmest at 0.548. The highest ever monthly anomaly was in February of 1998 when it reached 0.756. If the June anomaly continued for the rest of the year, 2012 would end up 9th. 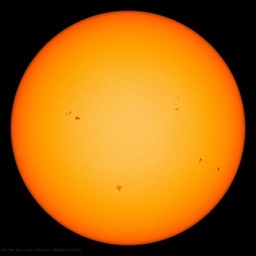 In order for a new record to be set in 2012, the average for the last 6 months of the year would need to be 0.738. Since this is close to the highest monthly anomaly ever recorded, it is virtually impossible for 2012 to set a new record. One has to back to the 1940s to find the previous time that a Hadcrut3 record was not beaten in 10 years or less. With the sea surface anomaly for July at 0.386, the average for the first seven months of the year is (0.203 + 0.230 + 0.241 + 0.292 + 0.339 + 0.351 + 0.386)/7 = 0.292. This would rank it 11th compared to 2011 when it was 0.273 and ranked 12th for that year. 1998 was the warmest at 0.451. The highest ever monthly anomaly was in August of 1998 when it reached 0.555. If the July anomaly continued for the rest of the year, 2012 would end up 10th. In order for a new record to be set in 2012, the average for the last 5 months of the year would need to be 0.67. Since this is above the highest monthly anomaly ever recorded, it is virtually impossible for 2012 to set a new record. With the RSS anomaly for July at 0.292, the average for the first seven months of the year is (-0.058 -0.121 + 0.073 + 0.332 + 0.232 + 0.339 + 0.292)/7 = 0.156. If the average stayed this way for the rest of the year, its ranking would be 12th. This compares with the anomaly in 2011 at 0.147 to rank it 12th for that year. 1998 was the warmest at 0.55. The highest ever monthly anomaly was in April of 1998 when it reached 0.857. If the July anomaly continued for the rest of the year, 2012 would end up 10th. In order for a new record to be set in 2012, the average for the last 5 months of the year would need to be 1.10. Since this is above the highest monthly anomaly ever recorded, it is virtually impossible for 2012 to set a new record. So on all five of the above data sets, for their latest anomaly average, the 2012 average so far is close to that of 2011. If present trends continue, 2012 will be warmer than 2011, but a record is out of reach on all sets. My projection for the five sets above is that 2012 will come in either 9th or 10th on 4 of the sets, but 5th on UAH. RSS is 188/204 or 92.2% of the way to Santer’s 17 years. P.S. Thank you for your comment Anthony! I was this past weekend enjoying a visit with friends in north eastern Oregon right on the Columbia River. The daytime temperature exceeded 100º. In the brief interlude of twilight the temperature dropped to 75º. That is not much time in this humid, irrigated area to exfoliate all those warm human-caused GH molecules, and yet it happened. Come the dawn they were still gone. WUWT? referring to the divergence in recent years of the 12-year linear trend between GISS analysis on one hand and, on the other hand, the HadCRUT3, UAH, and RSS data sets. This divergence in the trends over recent 12-year periods is very likely due to two factors. One is the treatment of locations which are remote from locations for which there are measured data. This particularly concerns the polar regions, e.g. the Arctic ocean. The temperature anomalies are interpolated and extrapolated from surrounding stations in the GISS analysis. HadCRUT assumes that the anomaly at those locations equals the Hemispheric mean anomaly. The data sets based on satellite retrievals don’t cover the polar regions. So, if there is a warming in the polar regions larger than the global average, like in the Arctic in recent years, the other three data sets have a smaller trend in the global temperature anomaly than the GISS data set. The second factor is the amplitude of the very strong El Nino of the year 1998 in the various data sets. The amplitude of this El Nino event is smaller in the GISS data sets than in the other three data sets. I suspect the difference to HadCRUT3 is again due to the larger weight of the Arctic data in GISS analysis. And the tropospheric temperatures data derived from the satellite measurements appear to be more sensitive to ENSO than the surface temperature data. Thus, the stronger El Nino signal in the other data sets strongly affects the results from the trend analysis for the recent 12-year periods. One has to keep in mind that these trends are not statistically significant. So there isn’t really any statistical difference between the trends despite the divergence. HadCRUT4 is closer to the GISS analysis. HadCRUT4 includes more measurements from the Arctic than HadCRUT3. REPLY: I think it has to do with the fact that few people trust GISS anymore. After all, why would anyone trust data published by a scientist who has a criminal arrest record for advocacy of said data/results such as Dr. James Hansen does? I sure don’t. Here, you just apply non-scientific arguments, ad hominem, to dismiss scientific research the results of which you apparently don’t like but can’t refute on scientific grounds. REPLY:“as a citizen”? I call BS on that. He wouldn’t be invited to these protests if he was “just a citizen” He’s your boss so I understand you defending him and yet, he still has an arrest record due to him putting science advocacy ahead of science. As usual, you are doing a good job holding Perlwitz’ feet to the fire. Hansen’s wild-eyed predictions are indefensible, as are the GISS “adjustments” of the temperature record. It is reprehensible that a repeat scofflaw like James Hansen is rewarded with a job that allows him to use his high government position to disseminate bogus alarmist propaganda. None of Hansen’s predictions have come anywhere near being realized. Anyone with such a terrible record should be dismissed as incompetent. Instead, Hansen is given free rein to make his alarming predictions — while being paid by public funds to scare hard-bitten taxpayers into opening their wallets over an absolutely false alarm. Disgusting. Hansen should be in a federal penitentiary, not worshipped by sycophants like Mr. Perlwitz. Down here in Oz our winter has been wet and some what cool, thou’ our green masters are telling us it is hot and the great barrier reef needs a parasol. Looking in from the outside it would seem our warming has been a little puffed up, the warming in the USA is most likely a cooling trend for the last decade. Time to put a few extra cords of fire wood in the shed. It is mathematically trivial to find a decade, or even 13 years of temperature data from various sources that show no statistically significant cooling for the period. Or significant warming or statistically significantly stability. Claiming that temperatures have been ‘unchanged’ for eleven years in the GISS data or some other source is just as right, or wrong, as claiming that they show a continuing warming trend. The variance mainly caused by ENSO fluctuations that are around double the decadal trend render any short record incapable of distinguishing between stasis, cooling or warming. The key indicator is what trend, or stasis appears when the record is extended to a length that DOES generate statistically significant results. It is notable that for all these records with no significant trend over a short period, as soon as that period is extended back a year or two the warming trend does become statistically significant and unequivocal. The frequent claim that warming is not detectable in the last few years of data is rather like claiming that the advent of summer is not detectable in a week of temperature data. But in the part of the climate that encompasses over 70% of the energy involved in warming, the oceans, and is not so affected by the ENSO fluctuations, a clear significant trend of warming CAN be seen in the last decade of data. ….Expect much more of these extremes in both directions as the polar amplification of AGW causes weather patterns not seem for at least a thousand years ! BULL, I saw similar weather in the 1950’s – 1970’s Your probably just too young. …..As for media coverage, I can assure you that, if we see a real and documented long-term trend toward lower temperatures, record lows, or if someone shows that global warming is NOT happening, it will get all sorts of media attention. Til then, stay cool! The media knows which side they are on it it is not the side of the little guy. It is on the side of the guy who owns the press, owns the mortgages and pays for advertising. …. I left my law firm to accept a position that had rather unexpectedly fallen in my lap with a phone call from Enron, asking me to be their Director of Federal Government Relations. Everyone polled suggested it was a great opportunity, a company admired throughout town, not just by the current (Clinton-Gore) administration with which it was very close, but by Republicans, too…. …the next day I was tasked with sitting in for “Kenny Boy” [Ken Lay] at a meeting in fancy New York law firm offices (in DC), around a table of Baptists and Bootleggers, rent-seekers and green puritans, discussing how to ensure a global warming treaty came about, of our collective design, and how to rope the U.S. in. …So I fired off a “Houston, we have a problem” missive to my boss asking if Enron knew what it was getting into in this group. That’s when they explained the specifics of their business plan to me – which did include setting up a trading business with Goldman [Sachs], by the way, as one of Goldman’s energy practice chiefs at the time also roared to me in joy about about all of the money they were going to make. This cannot conceivably be news to Gore and his VC partner and former Goldman [Sachs] Pooh-Bah Blood [David Blood] discussed in the linked item. … fast forward… I’m gone, and Enron and the greens are continuing on their way with what happens to be Congress’s current agenda…. The intervening event? An August 4, 1997 Oval Office meeting with Kenny Boy, (then-) Sir John Browne of BP, and the President and Vice President of the United States…. So what was in it for Al Gore? Gore Pocketed ~$18 Million from Now-Defunct Chicago Climate Exchange via Generation Investment Management. Didn’t someone say a sucker is born every minute? seems like Gore found a whole bunch of them. Al Gore, the former US vice president, could become the world’s first carbon billionaire after investing heavily in green energy companies. Also see “Red Hot Lies: How Global Warming Alarmists Use Force, Fraud, and Deception to Keep You Misinformed“. I do find it incredible how warmists continue to ignore all the evidence that this was a money making scheme from the get go and the Energy Corporations, bankers, politicians and the Media were all in on it. You do not have to be able to follow the science, all you have to do is Follow the Money. ….If you have heard that global atmospheric specific humidity has decreased over the last 60 years you must have been listening to Monckton…..
Actually I was listening to NOAA. You know a department of the US government? No, I remember the cold winters of the fifties. And you certainly did not see similar weather in the 50s-70s to the recent record heat waves that were hotter than ANY recorded. Or the Arctic ice loss and polar warming that is also greater than any seen in the historical record. Baloney. The historical record has plenty of examples of Arctic ice disappearing. Here is one of many. And it is naturally warmer now than in the past, because the planet is emerging from the LIA — one of the coldest episodes of the entire Holocene. There is no scientific evidence that human activity has anything to do with the Arctic or global warming. I love the smell of desperation in the morning. You really have to have blinders on to think a statement like “Or the Arctic ice loss and polar warming that is also greater than any seen in the historical record” has any truth to it whatsoever. Why the qualifier “in the historical record”? In order to set the parameters of the discussion. Outside these parameters, they are sunk. The qualifier tells me who the real (d-word)s are. The statement does not stand without the qualifier. The data sets based on satellite retrievals don’t cover the polar regions. That is true, but it seems as if GISS goes way overboard to compensate. With the circumference of Earth being about 40000 km, the distance from 82.5 to 90 would be 7.5/90 x 10000 = 830 km. So the area in the north NOT covered by RSS is pir^2 = 2.16 x 10^6 km2. Dividing this by the area of the earth, 5.1 x 10^8 km2, we get about 0.42% NOT covered by RSS. (It just seems to be the north pole that is the issue with low ice, etc.) The anomaly for RSS for 1998 was 0.55, while it was 0.476 for 2010. The anomaly for GISS for 1998 was 0.58, while it was 0.63 for 2010. The relative difference between 0.074 lower and 0.050 higher is 0.124. If it is assumed that this 0.124 is due to 1/230 of the area of the earth, then that part above 82.5 degrees must have been 230 x 0.124 = 28.5 degrees warmer in 2010 than in 1998. There is no way that this was the case. And applying Hadcrut3 statistics to the issue gives about the same results (27.6 degrees). Then there is the issue of why this polar amplification had such a huge affect in 2010 but virtually no effect in 1998. Do you have a source? A) There is greater variance with higher temperatures? B) If A, then is there evidence that temperatures do override the dampening effect of high humidity? Query: what dampens temperatures if it isn’t water vapor? Like in: Desert? Polar? Tropics? On the Dessler 2010 reanalysis reference. I went back to Steve McIntyre’s blog and re-read the discussion on monthly centering and the subsequent dialogue with Nick Stokes. What I took away from that exchange, the statistical use of monthly centering could and did give spurious increase in tropospheric moisture and that the Paltridge’s weather balloon data showing a decrease in tropospheric moisture had not been refuted by Dessler’s reanalysis. A last point, your: rising temperatures disrupt previously stable weather patterns (short term time scale). I thought the weather was unpredictable more than 10 or so days out because weather is chaotic. Is chaos stable? It seems that earth’s stable temperature range is due to its oceans and moist atmosphere. Again, moisture trumping all sorts of calamities over 3 to 4 billions of years (long term time scale). Nice graph, but you left off the uncertainty. By eye, I estimate the variance at about 0.15 and 95% confidence limits of +/- 0.3. That would not exclude a rise of 0.6C or a decrease of 0.6C over the 15 year period. Your claim is not justified by the data.That is why noone is getting too excited. I am a great fan of error bars, 95% confidence limits etc on graphs.They allow the observer to judge whether the patterns claimed by their posters are valid. Please include them on your graphs whenever possible. That would not exclude a rise of 0.6C or a decrease of 0.6C over the 15 year period. Your claim is not justified by the data.That is why noone is getting too excited. The data also would not exclude no change over the 15 year period either. I really wish it were true that no one is getting exited. But that is not the case. Under the circumstances, I would think it would be prudent to NOT spend a billion dollars on carbon capture as they plan on doing here in Alberta. For political reasons, some people are very excited over a warming that does not seem to exist. Would it be too much to ask that people NOT spend a lot of money on a perceived problem which may not materialize? As for the error bars, you would have to take that up with WFT. It only does that for BEST. The airports count posting was in the link in the comment to which you responded. It is based on GHCNv2 data (circa 2009) so I ought to re-do it with 2012 V3 data (but doubt much has changed). is the basic “airports study”. One of my favorites being the one in Milan (IIRC) where it had been a seaport and is now a sea of tarmac …. IMHO, based on not much more than staring at GHCN and USHCN data tables for about 4 years, pristine rural areas and places with a tendency to cool during zonal jet stream flow are dropping. Stations at places that rise during zonal flow and, more importantly, all the stations heavily biased by UHI and square km of tarmac and concrete on all sides (like Airports) are showing Massive Warming ( IMHO almost all due to cutting down greenery that transpires water and putting in dark solar collector heat sink pavement). This gets “averaged” in some creative ways (that mostly remove the cooling stations and then gets near zero or even ‘wrong way’ UHI “correction”) and that is what is called “Global Warming”. We, then, had an “ice age coming” scare being pushed (and most of us ignored it, too). The winds were more blustery and we had more planes brought down by vertical winds ( it was a new thing then to discover ‘microbursts’ and it was pushed hard in my groundschool in the ’70s). Then the PDO swapped. We went all stable and nice. Mellow breezes and not as much turbulence. Suddenly aircraft crashes dropped… Things were reliably warmer. Farmers were happier. Held all the way from about ’77 to 2000. Now we’re back in a cold phase PDO with ‘more blustery’ winds. IMHO, if you want to understand what is going on, first step to to NOT AVERAGE temperatures. Pick MIN or MAX (but not AVE) and plot it. Do that for individual stations. Look at the pattern over the whole continent over time. Then you can see the ebb and flow of the real drivers. Jet Stream shape. Solar cycles. Ocean state. My prediction would be that we’re going to see lots more record highs AND record lows (as we’re in a ‘loopy’ configuration) with the number of record highs slowly dropping as the number of record lows slowly rises (as we move into a Grand Solar Minimum during a cool PDO / AMO phase). But since we’re starting at a hot top of the cycle (and with tons of tarmac around most of the thermometers…) it will take a while for the cold records to show up. I have downloaded the code. Ported it to linux, and run it. I’ve gone through it end to end. As a professional programmer and someone who has managed production software products to and post shipment, it is my professional opinion that the GIStemp code is “not fit for purpose”. In one program in one line of code I found an error in how the F to C conversion was done that causes 1/10 degree of warming to the total dataset. Just as one example. One program was so full of dead code and mindless activity that it drove me to an online lament. Then there is the “sometimes wrong way UHI” done where Pisa was a classical example. During the Eocene epoch, Axel Heiberg and much of northern Siberia and Alaska were covered in temperate forests with redwood-like trees called Metasequoias, similar to those now seen in Northern California. In the Midst of a Land of Everlasting Ice They Have Been Digging Up Fossil Palms, Tree Ferns and Other Remains of Tropical Vegetation–A Time When Greenland Had a Climate Like That of Egypt Today–Remarkable Collections Brought Back for the National Museum. Greenland was once upon a time a tropical country. That is proved absolutely by the remains of an extensive tropical flora which are found there. For more than 55 million years, Ellesmere Island remained in one place while the world around it changed. Fifty-five million years ago, verdant forests grew at 75° North latitude. These wetland forests, [comprised] of species now primarily found in China, grew on an alluvial plain where channels meandered back and forth and periodic floods buried stumps, logs, and leaves intact. Today the forests are preserved as coal seams that outcrop on the edges …[of] modern Ellesmere Island, [where] there are no forests, and the tallest vegetation grows less than 15 cm high. Large parts of the area are polar desert, subject to intensely cold and dark winters and minimal precipitation. Strathcona Fiord (78° 41 ‘N, 82° 40’W) is a southern tributary of Bay Fiord. The landscape in the region is fragile and spectacular. The steep hills forming the sides of the valley rise about 400 meters above sea level. The striking arc of a terminal moraine marks the limit of the last ice advance in the area. Taggart Lake running eastward of the moraine drains Upper and Lower Taggart lakes into the head of the fiord. The Prince of Wales Icefield lies on the eastern flank of this valley. The only Pliocene High Arctic vertebrate fossil locality known is the Beaver Pond site at Strathcona Fiord. The Beaver Pond site was first noted by John Fyles (Geological Survey of Canada) in 1961. In 1988 he found the first vertebrate remains there. In 1992 vertebrate paleontologist, Richard Harington (Canadian Museum of Nature), began 10 summers of excavations at the site. What is unusual is that we’re in a state where the Arctic does NOT completely melt during an interglacial. We can only get an interglacial when it is warm enough to melt the arctic ice. This time we barely got it done. (Look up your Milankovitch for confirmation). The Holocene Climate Optimum (HCO) was a warm period during roughly the interval 9,000 to 5,000 years B.P.. This event has also been known by many other names, including: Hypsithermal, Altithermal, Climatic Optimum, Holocene Optimum, Holocene Thermal Maximum, and Holocene Megathermal. Northeastern North America experienced peak warming 4,000 years later. Along the Arctic Coastal Plain in Alaska, there are indications of summer temperatures 2–3 °C warmer than present. Research indicates that the Arctic had substantially less sea ice during this period compared to present. So about that “warming Arctic”… it’s been getting COLDER for 2000 years and the longer we can keep it close to ice free in summer the longer we hold off the next Ice Age Glacial. Well, I look forward to your publication in a peer reviewed climate journal then where you lay out the evidence that the GISS temperature analysis is all bogus. And where you show that the results and scientific conclusions from your own “correctly” done analysis differ significantly from the GISS analysis. Otherwise nothing of what you claim to have allegedly found is of any scientific relevance. While RSS has the longest time of zero slope, Hadcrut3 and Hadsst2 are right behind and are also over 15 years of no warming. Even GISS has no warming for 11 years and 5 months. And yes, there is noise. Well, I suppose you don’t know what to reply to my argument regarding the relevance of such technical information. Otherwise you wouldn’t just ignore it. This puts it at 90.7% of the way to Santer’s 17 years. What are “Santer’s 17 years”? What is supposed to happen at 17 years? REPLY: For the most part, there are few Arctic temperature measurements above the Arctic circle. GISS goes way overboard interpolating Arctic surface data where none exists. One only has too look at the station distribution in those latitudes, and then compare it with the interpolated output made by GISS to see this. I see, you have an opinion. For what reason someone invites Hansen is irrelevant with respect to his civil rights. He is a citizen and it is his private business to engage in political activism, whether you like it or not. It’s news to me that scientists, even if they are employed by the government, are not allowed to have political views and to express them in their free time. I’m not a federal employee. Jim Hansen is not my boss. Oh, I’m not upset. I’m glad that you reveal here what you think. I just see this alleged violation of this Hatch Act as wishful thinking on your side. Jim Hansen, being a federal employee, is not forbidden to engage in political activism in his free time. Being the director of NASA GISS doesn’t change this. I think you have some problems with the concepts of democracy and civil rights. REPLY: Oh, please. Prove then that Dr. Hansen did these things in his “free time” from GISS, lets see the evidence. Prove that he was totally detached from NASA. Show us the requests for leaves of absence, and the approval of them, or your concept is one of opinion and not of fact. And while you are at it, let’s see where you are then in the tree structure so we know exactly who we are dealing with then. I think you are full it it, because your actions say otherwise. When you first started commenting on this blog, you were using your at work network infrastructure. Now that has disappeared, replaced with a local ISP, and you have stopped commenting during GISS working hours. I think you’ve realized that doing such things could in fact get you in trouble, just like the things Hansen is doing will probably get him in trouble someday when NASA has an administrator who isn’t afraid to hold people accountable. What’s next or your plan, an arrest record like Jim Hansen? Seems that based on your emotional issues you’ve been displaying you are headed down the path of activism just like him. As usual, you are doing a good job holding Perlwitz’ feet to the fire. That must be the reason why Werner Brozek e.g. doesn’t answer my questions in reply to his assertions or doesn’t name the scientific reference for which I asked. Hansen’s wild-eyed predictions are indefensible, as are the GISS “adjustments” of the temperature record. Oh, Smokey has some little pictures again. One is even animated! The climate hoax cabal is shocked of being demolished like this. Hansen should be in a federal penitentiary, not worshipped by sycophants like Mr. Perlwitz. If you think the nature of Nature to change is now unnatural because of Man, you might be a green-neck. Anyone who understands math and graphs can see your explanation is wanting—it does not legitimize the divergence. GISTemp has diverged from all three of the other data sets in recent years. Before that divergence the four data sets had a relation ship unlike the relationship they had after the divergence of the one set happened. That shows something is going on with GISS data that is not in the others. If two data sets had gone off in divergence that GISTemp has there could be some acceptable explanation. Your explanation, for example, may carry some weight then. But GISTemp is the only one showing warming that the others do not. James Hansen is an environmental activist. This clearly leaves one with legitimate suspicions about the warming in his data set that has passed through his hands. The data set of a global warming activist, who is called the “grandfather of global warming”, shows more warming in recent years that other well known data sets do. The explanations that try to legitimize why this lone data set shows this warming may ring hollow to many people. As soon as GISS allows “skeptics” to sit in James Hansen’s seat at GISS, all and any “skeptics” as would wish to do so, and are allowed total access to all temperature data that is found anywhere in any computer in that department, and after having examined the data and found they come up with the same output James Hansen and others working in that department have come up with, I will then find no reason to be suspicious of the numbers being produced by that office. Somebody needs to point him at the ClimateGate Emails where he can see how subornation of peer review has been fully exploited and it is now Pal Review. Mr. Perlwitz, I don’t give a tinkers damn for what you think about me, or what I’ve done; and NONE of it needs any “review” beyond being up and published for anyone who cares to read it. There is more to life than journals and more to truth and Pal Review. The Team have completely discredited the process of science (as they do it) and are busy corrupting and smearing the reputation of many (formerly) fine organizations. What they fail to understand (and what you clearly don’t get) is that when someone has a High Reputation, and starts selling Timeshares or pedaling soap in late night commercials, it only works for a little while. Then THEY have the loss of reputation as “folks catch on”. The GIStemp code is badly written, implements bad procedures, produced ‘irreproducible results’, and has little connection to reality. It “Tells Tall Tales” (especially about the Arctic) and I’d not trust it for any use at all. It is far better to just use the basic data prior to it being molested. Why would the occurrence of some record lows be “doubly bad for warmists”? Jan, something did not seem right about me missing something so I double checked and apparently missed this one. I apologize for that. As for the two record lows comments, we are at the high point of the sine wave so a record low would be rare for that reason. But apart from the high point on the sine wave, it is generally accepted that we have warmed up about 0.7 degrees C since about 1750. The combination of both factors should make record lows very rare indeed. The fact that there were so many recently suggests that the CO2 is not causing catastrophic warming. I realize this is just weather, but it still does not look good for warmists. First, we get the ~”all the code is public. ANYONE can go look at it and see for themselves”. It is such pointless GAME PLAYING that is one of the hallmarks of deception, IMHO, and that kind of thing was one of the first things to convince me that one side was playing games (the warmers) while the other side was looking for real ground level truth. If you think that the only people qualified to disagree with you are the people that agree with you, you might be a green-neck. A post in this thread is an example of pure pseudoscience. consists determining the nearest possible approximation to ‘truth’ by formulating ideas then attempting to find information which refutes those ideas and amending or rejecting those ideas on the basis of obtained information. consists of deciding an idea is ‘truth’ and attempting to find information which supports the idea and ignores information which rejects the idea. All information pertinent to an idea is of “scientific relevance”. In this case, the idea is that the method used by GISS is correct. “I have found an excuse which I will use to ignore your alleged errors; i.e. I will pretend the information does not exist – or is not of scientific relevance – unless it is published in a manner and a place I specify”. PS I think it useful to keep a list of pseudoscience posted on WUWT by Perlwitz. The list grows and grows. Yes, and nowhere did I say it wasn’t. But the statements in sentence 2 and 3 in your reply were mere statements of opinion. REPLY: Oh, please. Prove then that Dr. Hansen did these things in his “free time” from GISS, lets see the evidence. Prove that he was totally detached from NASA. Show us the requests for leaves of absence, and the approval of them, or your concept is one of opinion and not of fact. I’m not the one with the burden of proof with respect to your accusations against Jim Hansen. You make accusations against a person, you have the burden of proof. And while you are at it, let’s see where you are then in the tree structure so we know exactly who we are dealing with then. A look in the GISS directory could already have answered all your questions with respect to my primary affiliation. But what I observe here, not just with respect to this factoid, there seems to be a pattern that you prefer to make assertions before doing proper research. Because I work at GISS. There aren’t only federal employees working at GISS. I think you are full it it, because your actions say otherwise. When you first started commenting on this blog, you were using your at work network infrastructure. Now that has disappeared, replaced with a local ISP, and you have stopped commenting during GISS working hours. What are supposed to be “GISS working hours”? I don’t have regular working hours. I’m not paid for a 9 to 5 job. I also often work from home, since I have a nice, large home office with a great view. You worry too much about me. You should rather worry about your own issues, of which you seem to be projecting a lot on others. Going down the path of Jim Hansen would not be such a bad one. He is an internationally well respected scientists and what he says matters. There are much worse paths to go down. For instance becoming part of an angry fringe group, who has lost the scientific argument and therefore doesn’t have much more left than raging in opinion blogs like this one here, and to delve into absurd fantasies about a worldwide, omnipotent conspiracy that was suppressing “The Truth”. REPLY: Yeah I’m sure GISS will respond timely to the FOIA requests just like they have in the past /sarc. They will cite “employee privacy” and tell me to pound sand, thus your “burden of proof” claim is unobtainium. I look forward to seeing you arrested with Jim soon. You work at GISS, but aren’t a federal employee? Check. That makes you expendable when the reorganization comes. BTW when will you be pushing your partners at RC to allow for skeptics such as myself to post there without their comments being immediately deleted? Since you are so concerned over the issue here (from your smear blog posting) I’d like to see that email where you take your concerns for “free speech” to the very people in your office who suppress it. Or, will I have to FOIA that one too? Your attitude towards people here suggests you embrace the “instant deletion” of RC comments by skeptics such as myself. I look forward to your position on the matter. So you get a “bait and switch” process. “Anyone” can go look – as long as they say it’s all just fine. Say it isn’t, well, you are not anointed enough then… So what’s the point in saying “Go look” if the intent is to dismiss the results of the looking? I haven’t dismissed anything. If you think you have found something substantial then publishing it in a peer reviewed climate journal would be the next logical step. If you don’t have enough experience get someone on board who does. What about McIntyre? Why don’t you try to get him onboard? He should be very eager to publish something that proves all those ugly analyses from GISS about global warming as bogus. There are enough specialist journals in the field where this could get published. And if nothing helps, there is still Energy & Environment. And here comes the conspiracy fantasy again. Another meme and talking point in the fake skeptic universe. All the climate journals are under the control of a sinister global, omnipotent conspiracy, so that “The Truth” can’t get published. Excuses, excuses. The GAME is that I request you and your friends have to uphold the same scientific standards as working scientists are mandated to fulfill to get published with the results of their research, especially if you want to question the validity of those results. To uphold a high level of scientific standards is the function of the peer review process. It doesn’t always work out, reviewers are not infallible, editors make mistakes too, but the standards are in place. And once you do I will accept you as true skeptics. You seem to think that is such an unfair game toward you, currently. But it’s the other way around. You don’t want fairness, because you want a privileged treatment compared to working scientists. You want the elaborations in your opinion blog be seen on equal footing, but you don’t want to uphold the same scientific standards. Or you want to lower the standards altogether. The ones who don’t like a rigorous peer review process are the ones who want to lower the standards. But there is no ‘gatekeeper’ on my postings. And nothing that prevents you from asserting whatever you want and its opposite in your opinion blog. And it ensures that nothing what you produce there is put under the same scientific scrutiny by the scientific community as the scrutiny which is put on the results from research published by working scientists. You don’t have any mandated standards of a scientific discussion, standards like everything has to be backed up with references and proof of sources. You don’t have to follow rules like stating clearly the assumptions, that the conclusions are logical and sufficiently backed up with the evidence provided, that the methodology is sufficiently described to be able to scientifically reproduce the results, and to refrain from attacking other scientists, instead of providing scientific counter-arguments, if you don’t agree with the results from the research provided by the other scientists. I’m not going to take someones elaborations as equally seriously as a real scientific publication, whatever this someone asserts how important it is scientifically what he has done, if this someone refutes to submit to the same standards to which working scientists are required to submit. You and Mr. Courtney are allowed to complain about this to the Internet. Wow, just wow, that has to be the most arrogant condescending comment I’ve ever seen. This while whining in blog posts at your new blog that a couple of your comments got deleted here out of the now over 150 you’ve made. Mr. Perlwitz, I think I shall make an example of your comment. Until that time, I suggest for your own good that you limit your postings here, you aren’t making any friends, and you aren’t convincing anyone with your attitude. I have often disputed comments you have made on this blog but I don’t think I have ever before had reason to thank you for one of your posts. Hence, I take this opportunity to thank you for your post at August 22, 2012 at 7:44 am. Thankyou for the laugh. As you say you do, I work from home so I often need a laugh to lighten the working day, and after reading your post it took minutes for me to stop laughing. Thankyou. I really did enjoy your Pythonesque reply and I would appreciate more and similar comedy, please. You work at GISS, but aren’t a federal employee? Check. That makes you expendable when the reorganization comes. If you say so. I’m certain you look forward to it. BTW when will you be pushing your partners at RC to allow for skeptics such as myself to post there without their comments being immediately deleted? I don’t have anything to do with maintaining the RealClimate blog. Btw: I have seen that true skeptics can place their comments at RC. I’d like to see that email where you take your concerns for “free speech” to the very people in your office who suppress it. Or, will I have to FOIA that one too? No one is entitled to “Free Speech” on private blogs. Here on yours, or on RC. Censorship is up to the discretion of the blog hosts. Why don’t you document the comments by you that allegedly get deleted from RC, like I document comments by me that get deleted here. Then everyone can judge for him/herself about the content. REPLY: Oh, I have, and you’ll see them in the upcoming blog post about you and RC. In the meantime, for your own good, I suggest you limit your comments here. “No one is entitled to “Free Speech” on private blogs. Censorship is up to the discretion of the blog hosts.” yet you complain about two missing and some snipped comments here out of the over 150 you’ve made. Your hypocrisy is boundless. I have never used the “Free Speech” argument with respect to the snipping of my comments on your site or demanded that you post my comments appealing to “Free Speech”. I have more than one time emphasized in previous comments, that it is up to your own discretion what you do here, since it’s your blog. So what again is supposed to be my “hypocrisy”? You are making things up. Wow, just wow, that has to be the most arrogant condescending comment I’ve ever seen. Really! After you and your friends write comment after comment with statements in which I’m personally attacked and my person is made a topic here, and not the first time, it riles you up when I get a bit snarky. Now, that I call hypocrisy. Until today I had not had any reason to thank you and this is the second time I write to thank you today. I did not think you would fulfill my request so soon, but you have provided your post at August 22, 2012 at 9:41 am. Thankyou. Please keep them coming. Until now I had failed to recognise your talent for comedy and I am impressed by it. “Here, it’s all public, even the unwashed can check for themselves” followed by “Oh Dear, someone looked! Well then, it MUST be ‘peer reviewed’ to have merit” (so opinions not in favor can be dismissed). The response is a long tirade on how peer review is the only Holy Grail for truth and an assertion that I’m indulging in a “conspiracy fantasy”. Don’t know if it is a symptom of a cognitive defect or just a very broken ‘debating’ style. 1) No, there is no “grand conspiracy”. Never have thought there was. That is YOUR fantasy. There is a “strong social bias”. The natural outgrowth of how societies like to pack political organizations with “one of their own”. Simple test: Look at how many grants are given by NSF and other NGOs to skeptical scientists vs the kind of nutty stuff that gets grants on the “warmer” side. (Tarps over the Great Barrier Reef? Dog Poo fermenters to ‘fight Global Warming’?) Second simple test: Look in the Climategate Emails at the direct stated behavior of strong arming Journal Editors who dared to publish skeptics articles. Look at the emails about attempts to sink skeptic’s papers. Clue: It’s not a conspiracy theory when the folks doing it are caught red handed. 2) Your “Excuses, excuses” line implies that I am making an excuse for not doing a paper to be published. That is YOUR desire for me to do what YOU want. The original thing you said was acceptable was for folks to just go look for themselves. You did not say “go look for yourselves and get a paper published in an acceptable journal.” So I’m making NO EXCUSES, but simply did exactly that thing you had said was a fine thing for anyone to do. Look for myself. Only after the “it’s crap” assessment came back do you change the “requirement” to include a “go get published” rant. Clue: My statement above is NOT about peer reviewers. It is about YOU changing YOUR terms from ‘anyone can go look’ to ‘peer review it or it is worthless’ when confronted by things you didn’t like. “The Game” is the one YOU are doing with the ‘bait and switch’ debating. The old Two Step side step. So your attempt to once again shift away from your ‘bait and switch’ to a discussion of the merits of peer review (and a smear of some kind of conspiracy theory assertion) is noted. Slippery as an eel in mud comes to mind. 3) I’m a semi-retired private person. I’m not interested in playing the silly Bridge Game of “Climate Science Peer Review”. All I care about is truth. I can find more of it, faster, just ploughing through and not wasting my time polishing papers. I might do it someday, but as I’m doing this on my own dime and my own time and for my own learning and advancement; I see no reason to waste even one minute of my time ‘pushing papers’. Clue: I’m not interested in “playing your game”. I’ve got a life. 4) There is ample evidence for “duck, dodge, weave, delay, denigrate, attack and slime” in the Climategate Emails. Use of Peer Review as a hurdle to deflect folks, then ‘pocket-veto’ their papers via influence pedaling. You demand that I submit to that. I have no need, and less desire. It may be central to your mindset and your life; it is a waste of time and distraction to me. As you say “Not my problem”. 5) The good news is that post Climategate there has been something of a break in the Pal Review process. Knowing that “the game is rigged” at several key journals, more folks are going to “other” Journals outside the cabal. We’re seeing more interesting names now on some articles. IMHO, the future rests with what I would call “Open Review”. Folks publish electronically to an ‘interest group’ (folks subscribed to a blog, for example) who ‘bat it around’ and do the Peer Review feedback process. If desired, sub-groups can be set up on a password basis. Once through that (with all subscribers in a review group seeing the comments), the author can then submit to a Journal or simply go to “Open Published” on the site (i.e. move to the “published” pages instead of the “private / password protected” pages). In that way no one can act as gatekeeper, yet folks wanting to “only read what is past review” can choose what level of subscription to read. I’ve chosen a role I call “Plough the field”. I move fairly fast over large areas rapidly turning up what is of interest. Others, should they wish, can then take those things and do with them what they will. If they want to do a peer reviewed published article from it, that’s Fine With Me. (I have suggested that a small footnote would be a ‘nice touch’ and I’ve seen some already ;-). You see, I have no “ego” in this. “It isn’t about me.” So the ‘attack the messenger’ and the ‘appeal to authority’ and the ‘Peer Review Ploy’ are just wasted effort on me. So Hansen makes a ‘big splash’ via the whole Pal Review and News Hound Activist process, but it’s junk. Taking a year (or three?) to get a peer reviewed paper published (given the hurdles in the way) is far less important to me than just demonstrating his assertion is crap. Clearly, and rapidly. Also far more effective. Now if someone wants to lever off of that and spend a year (or more?) of their life in the rat hole of Pal Review (or find a Journal that is still honest and publish there), they are quite welcome to it. When the 95% confidence margins are large you get too many possibilities. It does not mean you can pick whichever you like. It means that that the no valid pick can be made at all. If you drew a similar graph using 1999 as your start it would show an upward trend, which would please a Greenpeace activist, but would be just as meaningless as your flat line. Robert Carter made two statistical mistakes when he started this “15 years with no warming” hare.First he started with a statistical outlier, unrepresentative of the longer term trend. 1998 was an extreme El Nino year. Secondly, as we discussed, the data is too variable to see a meaningful trend in the short timespan of 15 years. It is not a statistically meaningful pattern, but it makes good propoganda to impress the credulous. It does have an unfortunate side effect. Outside the sceptic community its statistical invalidity is recognised by other scientists and it tarnishes the whole of sceptic science. It encourages the view that if one widely repeated scientific statement by a sceptic is spurious, maybe others are likely to be equally spurious. Entropic still doesn’t get it. There is no “sceptic science”. There is only science, and pseudo-science. CAGW falls into the latter category. As for the former, the only honest kind of scientist is a skeptical scientist. The others are either dishonest or deluded. That includes all flavors of CAGW believers. 1998 was an extreme El Nino year. Unfortunately it stops in March, 2012, but the slope is negative from 1997, BUT it is also negative since 2000 once we get passed the huge 1998 El Nino. Jan P Perlwitz blah, blah, blah, in a condescending tone. You are right in all you say in your post at August 22, 2012 at 8:24 pm. But I again repeat the important fact which I always state when trolls obfuscate about the statistical significance of recent global warming. the statistically significant global warming from 1970 to 2000 has stopped. Entropic man does “get it”. But it is not what Entropic man is paid to say. On reflection I see that my post at August 23, 2012 at 2:29 am could be misinterpreted as suggesting you are a troll. That was NOT my intention and I apologise. You are right in all you say in your post at August 22, 2012 at 8:24 pm where you reply to the troll posting as Entropic man. Oops! And I have spotted another error. From habit I typed 95% when I should have typed 90%. I am truly apologetic for these mistakes in my post to you. I intended no personal offense (I should not make a post before breakfast). According to each of the global temperature data sets there has been no statistically significant (at 95% confidence) global warming in the last 10 years. and putting in start and end from 1992.6 to 2012.6, the slope is 0.138 +/- 0.175 C/decade. re your post at August 23, 2012 at 9:29 am. Thankyou for your forgiveness for my mistakes. On the point of confidence levels, it is interesting to note that whether or not one sees warming from 1970 to 2000 depends on the chosen confidence level. ‘Hard’ sciences use 99% and the period shows nothing at that level of confidence. But that period shows the fastest rate of warming since 1900. Of course, I am not. I am saying that detection of a trend depends on the confidence which one is willing to accept for the detection. This is not a merely esoteric point. How much confidence should one apply to detecting an effect which some (e.g. Perlwitz) claim warrants alteration of the economy of the entire world? I am saying that detection of a trend depends on the confidence which one is willing to accept for the detection. It is one thing to say it is warming, but we can only be 92% certain of that, but when a line is flat, in my opinion the error bars should make no difference. “The Hadley Centre for Climate Prediction and Research (HadCRUT) has long been the gold standard in climate data used by the IPCC, now a new analysis of the data by the UK Met Office shows there has been no global warming for the last 15 years. And in this case linear trends are being applied to data which is probably cyclical.